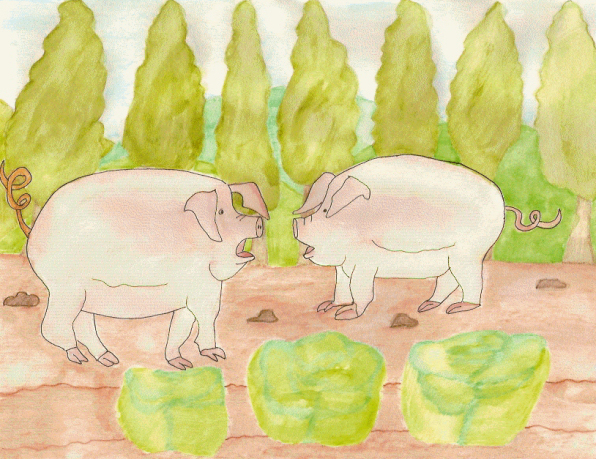 Two chubby pigs hid behind the large cabbages growing in the garden. "I must say, Beatrice, the garden's looking lovely at this time of year." Charlotte twitched her nose and grunted. She bit off another cabbage leaf. "I do so enjoy the manor. We've got the entire vegetable garden to ourselves, except when Thomas comes to shoo us away. Beatrice? Beatrice?" The pale pink British lop listened to Charlotte's words, but couldn't answer. Her mouth was full of crunchy green leaves. Snorts and huffs blew from her nose. When she'd finished her mouthful she turned to her friend. "I'm sorry, Charlotte. I was nibbling on these delightful cabbages. Surely you've tried some." Charlotte giggled. "Of course, Beatrice. When you've had your fill, do you fancy a trot down to the rose garden? This time of year the flowers are at most fragrant." The pig's long ears hung down to her nose. "Roses! How lovely. We must nibble on the petals." Beatrice climbed over the cabbage and stood in the grass. "Beatrice, I’ve been thinking. We're not getting any younger, you know. Our days of lumbering around the manor gardens will come to an end one of these days. I've heard that we lops are being sold and eaten as bacon and ham. Imagine that! Pigs of our class being referred to as 'bacon on hooves'. Why, I never!" "You mustn’t upset yourself, Charlotte dear. The Lord and Lady of the manor have treated us well all these years." The two waddled over to the rose garden and lay among the bushes, their noses twitching as they sniffed the fragrant flowers. From high above a fairy looked down on the two pigs. She leaned over a yellow rose petal. "Beatrice, Charlotte! It's so good to see you again." She fluttered down to the ground. "I've been busy over at Gilthrop Castle. I've been away far too long." Charlotte smiled. "You're looking well, Mildred. Your wings are as gossamer as the first time I saw you." "I like your dress. It's simply lovely. Not many can wear that shade of orange and get away with it," Beatrice said. "Mildred." Charlotte sighed. "Beatrice and I were just talking. We aren't getting any younger and we've been a bit afraid lately that we'll end up like so many other pigs, sizzling in a frying pan. It's rather upsetting to think about." The fairy lifted off the ground and landed on Beatrice's porky back. "I've seen it happen to the best." "It's shocking, actually. I'd love to spend eternity in these gardens, sitting among the cabbages, watching the butterflies and listening to the larks warble." A tear trickled down Beatrice's chunky cheeks. "Now, now, Beatrice. Let's not get all teary-eyed. I'm sure Mildred can think of something, can't you, luv?" Charlotte frowned at the sound of Beatrice's blubbering. "I'm sure I can and will think of something," Mildred said. "Why don't the two of you go and have a drink from the pond, have yourself a nap and I'm sure everything will be better when you wake up." The fairy flew off, disappearing behind the ancient oak tree. "She's right, Beatrice. Let's go down the pond. The fish always cheer us up and if we’re lucky, we might see a few ducks. I could do with a nap in the shade of the weeping willow. It’s such a lovely view of the whole manor garden. The rowan trees are in berry and the marigolds are in bloom." Charlotte and Beatrice shuffled over to the pond. After a thirst quenching drink from the pond, they chatted with the ducks and then lay down for a nap. The Lady and Lord of the manor stood looking out the bay window. "Darling, I've not see Beatrice or Charlotte for several days now. Do you think something's happened to them?" The Lady sipped her tea, holding her pinky away from the china cup and saucer. "I do say I agree. They've not been around. I must have Thomas, the gardener, keep his eye out for them." The Lord of the manor bit into a chocolate biscuit. Thomas grabbed his hoe from the shed and headed for the cabbage patch to weed. He looked from side to side as he walked, wondering about Charlotte and Beatrice. When he reached the vegetable garden he noticed how large the cabbages had gotten since he'd last weeded. "Time to put this hoe to use." Row by row he went, digging up every thistle and briar. "What's this?" He stopped, staring at something hidden between two plump cabbages. "Where did these come from?" He reached down and stroked the stone statues. "If I didn't know better I'd swear these were the double of Charlotte and Beatrice." Mildred giggled. She hid behind a rhubarb stalk. "Girls? Is that you?" Thomas knelt in the dirt. "You've turned into stone. The Lord and Lady of the manor will never believe this. I'll simply not mention it. You two girls can stay out here among your cabbages forever, undisturbed. You can watch the seasons come and go. Lucky girls! At least you didn't end up in someone's frying pan." He patted the two stone pigs and finished weeding. Mildred, seeing her job was done, flew back to Gilthrop Castle.